Career Decisions: Physical Therapy presents, a comprehensive guide to perspective physical therapy students. 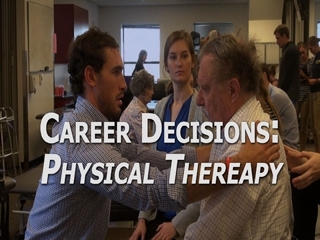 The program is designed to enable teachers and career guidance counselors a means to present a guide to choosing the physical therapy profession. Physical Therapy or PT has been a part of the American patient care experience for over a hundred years. PT has grown exponentially until in the 21st century it is an essential part of every patient’s medical team. Career Decisions: Physical Therapy examines five key areas in the PT profession: 1) opportunities to find a fulfilling career in physical therapy; 2) the many choices of schools for PT students; 3) what doctors and hospital administrators want in their physical therapists; 4) how PT has evolved to become a major part of the 21st century medical team; 5), and most important for the prospective physical therapist an examination of PT schools’ challenges. 00:05:54Chapter 1 includes information on Physical Therapy, Patients, Exercise, Movement Retraining, Movement Education, Mary McMillan, Physical Therapy History, Physical Therapy Schools, Research Based Programs, Contemporary Practice, Diversity, Patient Population, War and Physical Therapy, and Profession Autonomy. 00:06:49Chapter 2 includes information on Employment, Chronic Conditions, Ageing Patients, Medical Technology, Mobility, Healthy Functioning, Patient Care, Neurology, Physiology, Social Skills, Patient Relationships, Evidence-based Practice, Evidence-Based Medicine, Recovery, and Biomechanics. 00:11:37Chapter 3 includes information on Physical Therapy School, Medical School, Scientific Thinking, Biology, Hands-on Care, Biotechnology, Computer Technology, Perspective Students, Science, Neurology, Neuroscience, Human Exercise, Inter-disciplinary Care, Leadership, Passion, Compassion, Course Load, and Teamwork.